If this message is not displayed properly, click here please. 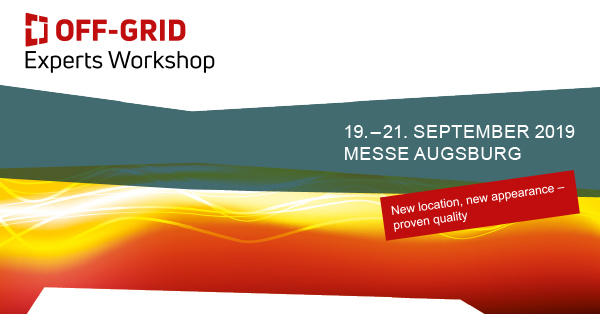 The planning for the OFF-GRID Experts Workshop 2019, which takes place from 20-21 September 2019 in Augsburg (with an additional Tech-Day on 19 September 2019), is in full swing. Numerous companies have already registered as exhibitors or sponsors. If you are also interested in presenting yourself, we recommend that you use the early booking deadline of 31 January 2019. We look forward to hearing from you! Use the early bird discount of the OEW19 until 31 January 2019! As an exhibitor or sponsor you will not only present yourself to an international audience (around 450 visitors from Europe, Africa, Latin America and the Middle East attended the last OFF-GRID Experts Workshop in 2017) but you will also make a significant contribution to the content of the event for self-sufficient power supply. If you book as an exhibitor until 31.01.2019 you will benefit from an early booking discount! If you are interested, please use our contact form or contact us directly. We will be happy to advise you. An unique programme in a family atmosphere for an extraordinary branch! The off-grid scene is not only regarded as inquisitive and innovative, but above all as hands-on, solution-oriented, determined and communicative. In order to meet all wishes, needs and ideas, the OEW offers a comprehensive and exciting event package: specifically selected lectures, an extensive accompanying exhibition, hands-on formats, a Tech-Day, side events and much more. Please contact us and discuss your participation in the OFF-GRID Experts Workshop 2019 - as an exhibitor, visitor or partner. We’ll be pleased to help you. If you don't want to receive any more messages (to: unknown@noemail.com), you can unsubscribe here.